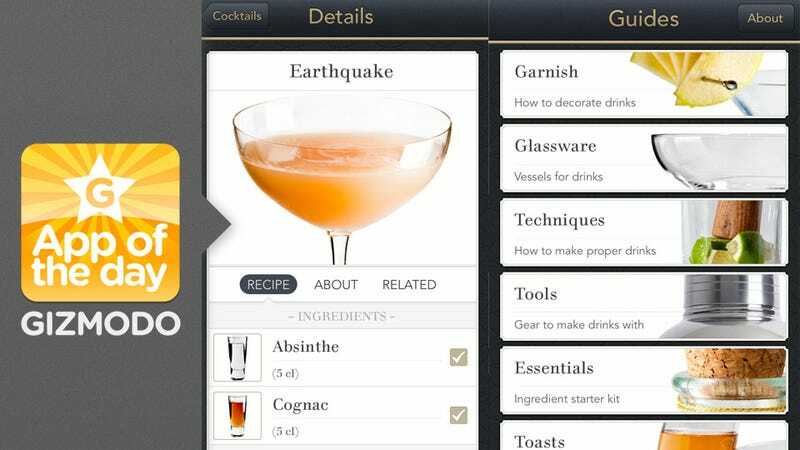 Cocktail apps are nothing new, but as they generally appeal to a demographic practically willing to drink gasoline so long as it'll give 'em a buzz, none really offered the refinement and knowledge we were looking for. Nothing, that is, until Minibar. Takes note of what you have on hand and the style of drink you're looking for to give you the perfect poison for your night out (or morning after) along with all the knowledge you need to fake mixology mastery like a pro. First off, the app itself is beautiful. Each clean tab is accompanied with an appropriate, often stunning photograph, so it's certainly nice to look at as long as you're still seeing straight. The inspiration feature is also fantastic, as it takes stock of whatever you have on hand to custom tailor you're selection, so you'll know exactly what you can make or exactly what's left to buy for your cocktail of choice. One of the best parts and what really sets it apart, though, is the vast amount of offline knowledge packed in. You get cocktail trivia, mixing tips, brief histories, and alternative garnish and preparation methods, just to name a few. And with over 100 different recipes at hand, there's a lot to learn.